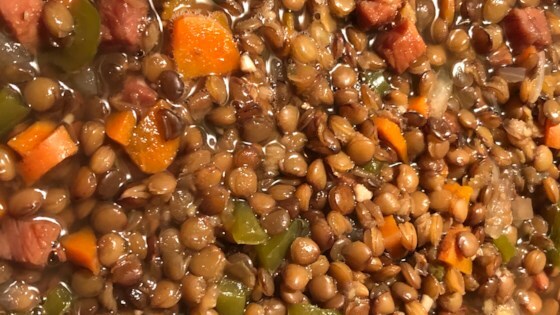 "I originally called this my 'experimental lentil' soup, patching together various other lentil soup recipes. I've been making it every fall for a decade now. What's listed here is a single recipe, though I can't remember the last time I've made such a small batch. It's great for freezing in individual servings for lunches." Bring water and chicken bouillon granules to a boil in a stock pot, stirring to dissolve bouillon. Place ham bone in boiling broth, reduce heat to medium-low, and stir in lentils. Simmer until lentils begin to soften, about 10 minutes. Stir celery, carrots, green bell pepper, onion, marjoram, and bay leaf into broth and simmer until lentils and vegetables are tender, 10 to 20 minutes. Turn off heat and remove ham bone from soup. Cut ham from the bone, cube the meat, and return meat to soup, discarding the bone. Hi. I had great hopes for this soup. I do not think that it rates a 5 star rating. It was adequate. The broth was thin. Not as savory and delicious as I wanted. Tried this recipe tonight. Came out great! Used the tricolor lentils for some extra visual appeal. Red lentils faded to brown, black held up nicely.